The phenomenon that is autotuning has clearly been a game changer where music is concerned in the last decade or so, and something which intended to perfect the pitch of one’s voice has resulted in vocals that are really far off from the original. Of course, some might even refer this as the T-Pain effect, since the artist has been one of the more popular proponents of this technique. 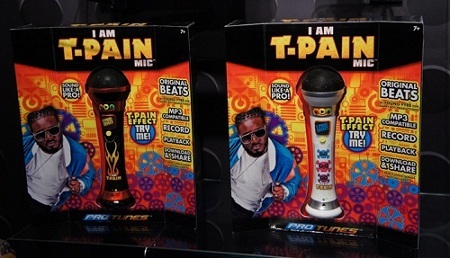 Well, here is the I Am T-Pain Mic that goes one up on the I Am T-Pain App for the iPhone, since you don’t even need to phone to get started in the first place. Jakks Pacific will be releasing this nifty little device for $40 when fall arrives, where it is capable of recording your voice and play it back autotuned. Heck, you can have some T-Pain fun by downloading the vocals to your computer. Time to play some prank calls and get gullible groupies to share a hotel room with you when everyone is drunk, claiming you’re T-Pain in the process? Perhaps, but you might find yourself to be in a whole lot of trouble the morning after. Is It a Scooter, a Bicycle, a Skateboard? No, It’s Sbyke !